Milan went the extra mile to throw a great party for Arnaldo Pomodoro’s 90th birthday, involving the most symbolic locations of the city, from Palazzo Reale to the Poldi Pezzoli Museum, the Triennale, and the Arnaldo Pomodoro Foundation. The project will be on display from November 30, 2016, to February 5, 2017, showcasing the cellar-sculpture crafted by the Art Master in Umbria through a virtual reality tour. The first symbol of this relationship was the “Disk”, created in 1992 for the 90th anniversary of Ferrari Winery. Ten years later came the “Centenarium”, a huge celebrative sculpture crafted to celebrate the 100 years of Ferrari winery that has since welcomed the visitors of Ferrari’s headquarters in Trentino. Now the time has come for the Carapace, a project that fully embodies the multifaceted talent of Arnaldo Pomodoro, who succeeded in turning a working place into a true masterpiece. 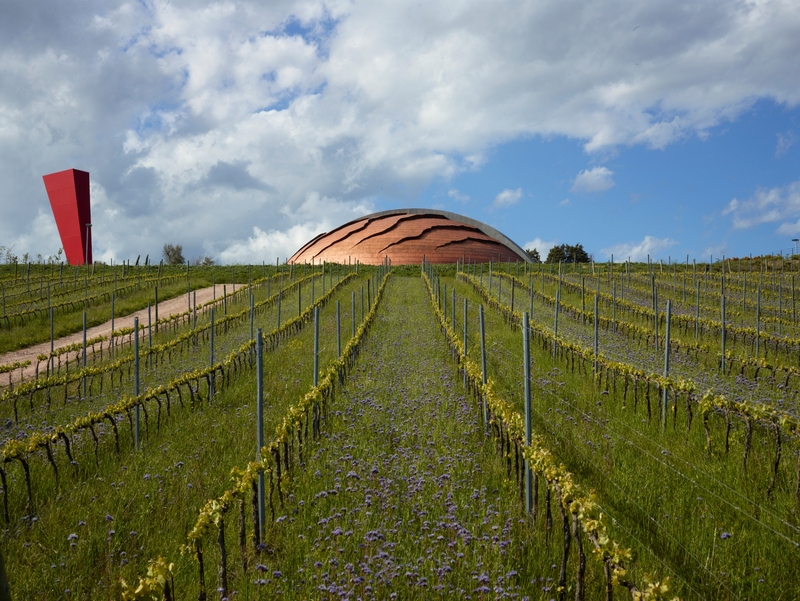 The Carapace is the first inhabitable sculpture in the World, where a powerful, charming, and long-lasting wine such as the Montefalco Sagratino is produced. It is not by chance that the cellar, which was opened back in 2012 in Bevagna, has become an unmissable destination for all people visiting Umbria. During the exhibition, not only will the Carapace project be on display with its blueprints and a 1:20 scale model, but it will also be open to the public thanks to the wonders of virtual reality: by using a Samsung Gear VR headset, visitors will be taken on a 360° tour among the vineyards of Sagrantino, walking over and under the dome of the Carapace, and getting even underground, in the barrel cellar. This innovative and exciting experience combines technology, tradition, and art to take the visitor on a journey to discover a magical place that perfectly encapsulates the principle of beauty and excellence that has always inspired the Lunelli Group.